By CNN'S SCOTT MCLEAN CONTRIBUTED TO THIS REPORT. 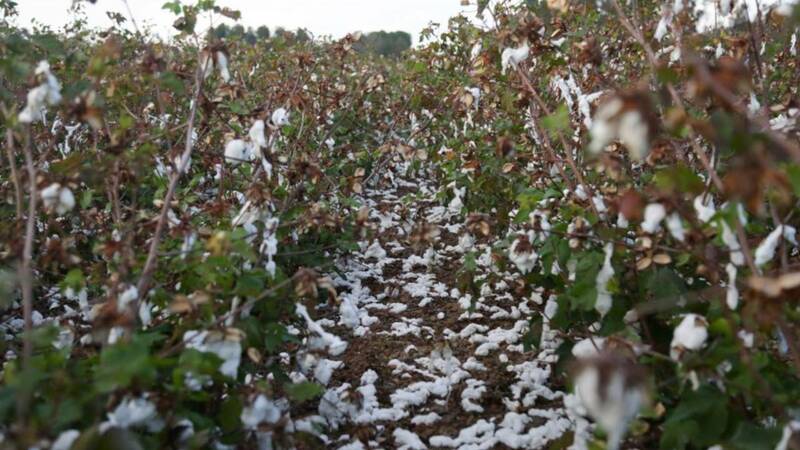 Georgia's cotton farmers say Hurricane Michael stole their crop of a lifetime and could put them out of business for good. (CNN) - Hurricane Michael's destructive path through Georgia left many farmers with ruined crops or dead animals. The Georgia Department of Agriculture said Wednesday that early estimates put losses at between $2.3 billion and $2.8 billion. "Georgia has long led in the production of several renowned commodities and now we have the dubious distinction of also leading in the devastation and incredible loss of these prominent crops," Georgia Agriculture Commissioner Gary W. Black said. Much of that devastation was in the timber industry in south Georgia where more than 1 million acres of trees were blown over and losses are about $1 billion. The news for cotton farmers was just as awful where record yields were expected but the storm left many growers worried they could lose their businesses. Crop insurance won't be enough for them. "It's painful to see all these years of work, in six hours' matter of time taken away from me," said Tom Windhausen, 60, who runs a farm in the fittingly named community of Cotton, Georgia. The veteran cotton grower, like other farmers who spoke to CNN, said he had a cotton "crop of lifetime" growing. On a recent visit, President Donald Trump sought to reassure growers in Macon. "We're working on it. You know that, right?" he said on Monday. "You'll be fine." "It's too bad, what happened to you guys," he said to the farmers toward the end of his visit. Cotton losses could approach $800 million, depending on what can be salvaged. Georgia also experienced major losses to its pecan and peanut crops as well as to vegetables such as sweet corn, cucumbers and soybeans. The storm killed more than 2 million chickens, the agriculture department said. According to the Center for Agribusiness & Economic Development, the value of Georgia's agriculture products in 2016 was $13.75 billion.